Do you want your golf cart street legal but don’t know where to start or what the requirements are? Think of these vehicles as a hybrid between a golf cart and a tiny car. They have seat belts, turn signals, headlights, rear lights, brake lights, windshields, and even individual Vehicle Identification Numbers (VIN). All of these are included for your safety and the safety of other drivers as you navigate public roads.You can drive your golf cart on roads with a speed of 35 mph or less if your golf cart is street legal. It must be registered as Low speed vehicle is it goes faster than 20 mph. Anything over 20 mph is treated as a motor vehicle under federal law. As of April 2, 2018 Knoxville city ordinance requires a permit to drive golf carts on Knoxville city streets. 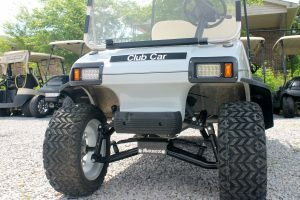 In order to drive a golf cart or off road vehicle on city streets residents are required a $25 permit fee, must be at least 18 years of age, able to provide proof of insurance and have the vehicle inspected.The inspection looks for obvious proof of insurance, safety flags, a visible safety triangle, and obvious defects that makes the unit unsafe for city streets. Applicants may drive their vehicle to the Knoxville Police Department for the inspection as long as they call 641-828-0541 first to arrange the inspection.